Facebook obviously doesn’t REALLY want you to unfriend that sleazy guy from uni or the annoying mate of yours who does nothing but complain about being pregnant, so instead the social network will now suggest these people be your ‘Acquaintances’ instead. Now admittedly the Acquaintances list has been sat there in the Friends tab for some time, but today Facebook has begun suggesting which weirdos you should put there. 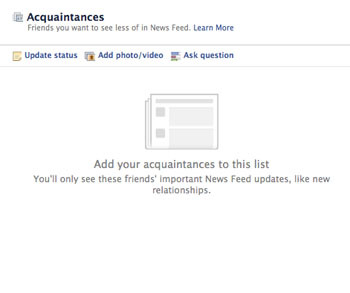 The great thing about the Acquaintances list is that the updates and content from the ‘friends’ you put there will appear less often in your News Feed and it’s easy to choose to not share some of your content with them too. The beauty of it all is no one will ever know they’ve gone from being a friend (or ex, or BFF, or even parent) to just an Acquaintance.